The goal is to design flapping-wing system based on avian flight. The advantage of employing avian-based flight is that the aerodynamics can be simplified by using simple up-down flapping motion with flexible membrane wing skins. The use of a flexible membrane allows the wing to passively change its relative angle of attack and camber during the stroke cycle. 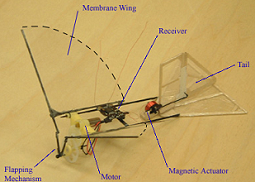 This is the mechanism that widely adopted in commercially-available ornithopters. Though rubber band-powered ornithopters have been around for hundreds of years, the advent of engine-powered ornithopters began in the late 1980s. Recently, we have built an avian-based flapping-wing mechanism to investigate the performance of a range of flapping-wings. Test stand and model prototype experiments were conducted to measure the lift and propulsive thrust generated by flapping wing planforms with a variety of nonplanar tips (varying wing tip arcs and tip anhedral). 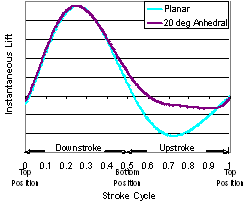 First, nonplanar tips have been shown to provide slight increases in thrust in fixed-wing aircraft. Second, avian flight indicates that twisting or folding the wings on the upstroke reduces the amount of negative lift generated. 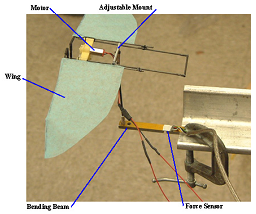 Third, model ornithopter builders have discovered that the use of curved spars can contribute additional lift during the upstroke. As flapping frequency was increased, lift generally tended to increase. As forward velocity and fuselage angle of attack were increased, wings produced more lift. Results indicated that nonplanar wings were beneficial to lift production especially with the polynomial planform. For all fuselage angles of attack tested, the anhedral wings consistently performed better than the planar polynomial wing. The polynomial planform with 20º tip anhedral produced the most lift overall, reaching a maximum value of 15.2 g at 17.8 Hz and 10º fuselage angle of attack. For all cases, the dihedral wing performed poorly. Based on the wind tunnel results, the optimum wing configuration for a flapping-wing MAV was determined to be a polynomial planform with 20º tip anhedral, trimmed at 10º fuselage angle of attack. A thrust analysis of the selected wing indicated that positive levels of thrust were generated at all angles of attack and wind speeds, although the thrust tended to decrease at high wind speeds and high flapping frequencies. Strobe photography indicated that the benefit of tip anhedral on membrane flapping wings was largely due to its ability to twist farther downward on the upstroke, which reduced the profile drag experienced by the wing. 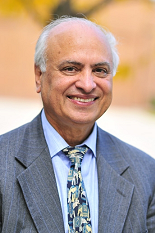 The future research will focus on the development of a comprehensive aeroelastic analysis including refined CFD coupling and systematically validating it with test data for a range of flight conditions that include flapping frequency, non-planar wings, flexibility distribution of wings and structural couplings.